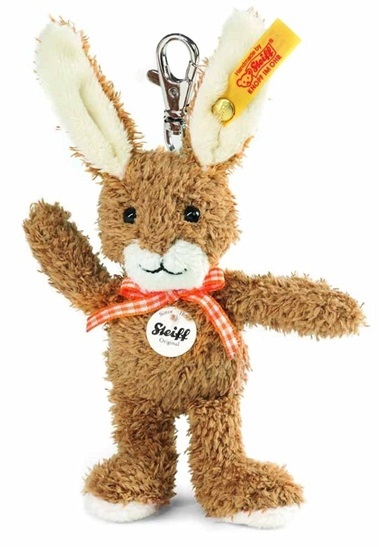 This rabbit keyring from Steiff is made of brown cuddly soft plush and is 4.7-inches tall. He is machine washable in a mesh bag, in cold water, be sure to remove the keyring first. He has black safety eyes and a black nose with a sewn-on mouth. A orange and white gingham checked bow is tied around his neck. He is perfect to decorate backpacks and is big enough to easily locate the keys in your purse.